Though at first glance it appears to be a dispassionate description, the implication that the British were preparing for a siege and the use of “insolent” when describing the troops’ parade into town suggest otherwise. Furthermore, Revere cheekily dedicated the engraving to the Earl of Hillsborough (1718-93), secretary of state for the colonies, in a cartouche at the bottom right that is bordered by a Native American standing on a British soldier. “This View of the only well Plan’d Expedition, formed for supporting ye dignity of Britain & chastising ye insolence of America, is hum’y Inscrib’d,” he concludes. Aside from any textual ambiguities, the enormity of resorting to military occupation would have been clear in such a detailed visual representation. Image and text 25 x 39.5 cm., on sheet 26.5 x 40.5 cm. 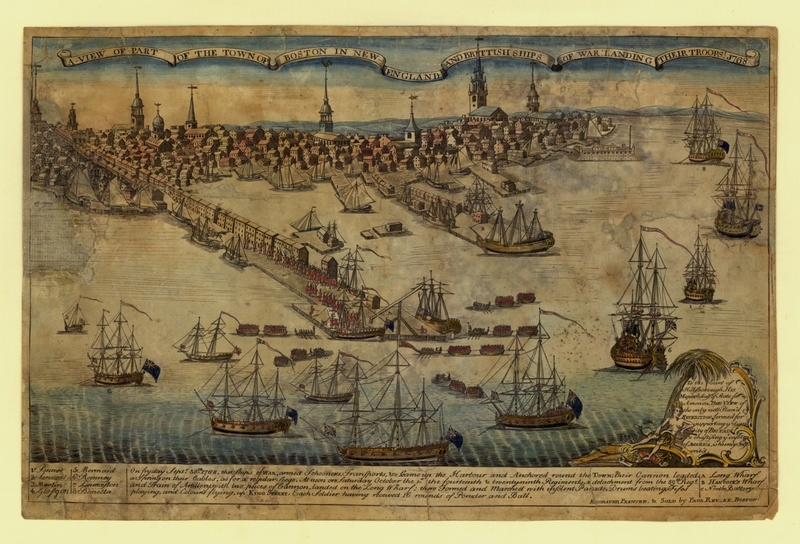 Revere, Paul, 1735-1818, “A View of Part of the Town of Boston in New-England and Brittish Ships of War: Landing Their Troops! 1768,” The News Media and the Making of America, 1730-1865, accessed April 21, 2019, http://americanantiquarian.org/earlyamericannewsmedia/items/show/27.